1. Combine the ﬁrst six ingredients and set aside as a dipping sauce. 2. Prepare the other ingredients and set them out on your work surface. Set out a bowl of hot water (110–120ºF) and a clean kitchen towel. 3. Put a sheet of rice paper into the water for about 10 seconds, just until soft (don’t let it become too soft; it will continue to soften as you work). Lay it on the towel. 4. In the middle of the rice paper, lay 4 shrimp pieces and about a quarter each of the carrot, bean sprouts, scallions, mint, cilantro, and peanuts. 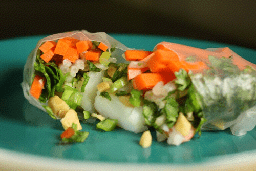 Roll up the rice paper, keeping it fairly tight and folding in the ends to seal. Repeat this process until all the ingredients are used up. Serve, with the dipping sauce.